Time for a truce between Gration & the activists? 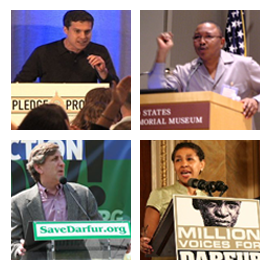 You are here: Home / Commentary on Darfur advocacy / Time for a truce between Gration & the activists? A day after all the hype and anticipation of the Sudan Policy Review announcement, I thought I’d share a few thoughts. Staff at Enough , GI-Net and Save Darfur have come out with disciplined, uniformly positive but cautious reactions to the Review (although as pointed out on Sahel blog, John Norris and John Prendergast at Enough seem to be reading from slightly different playbooks). While all are stressing that implementation is the key, the corollary of this is that they are all accepting what was released as being basically sound policy. I have to say, I agree (although see my irritation some fudging between the description of what the policy is trying to do in Darfur and what it actually tries to do). Contrary to some of the media and advocacy hype, the “verify, then trust” approach announced yesterday is what Gration himself has been talking about from the beginning with those “stop-go” charts . Of course he has undercut himself a painful number of times, and spoken to the media in ways that have encouraged the view that he is naïve. But at the end of the day, in terms of this (and frankly many dimensions of the Review – key among them, the emphasis on engagement with Khartoum), Gration’s approach has been endorsed. This raises an interesting issue for those in the advocacy community who have, in the past weeks and months, called for Gration’s resignation. Will they follow the “mainstream” (for want of a better word) advocacy line being presented in the media today and endorse the Review in principle while stressing the jury is out until implementation occurs? If so, can they keep calling for Gration’s removal? I don’t think so, save arguing that the Review is not as aligned with Gration’s stated (if not always evidenced) approach as I read it to be.